I mixed up my favorite chocolate cake recipe and baked the cake in a 9x13 pan. A 1/8 sheet was all that was needed so after I baked the cake and it cooled, I then cut the cake in half to get the appropriate size needed. I added a quick crumb coat to the cake and set it in the fridge to stiffen up. While the cake was in the fridge I mixed up the colors needed using a buttercream frosting and food coloring. 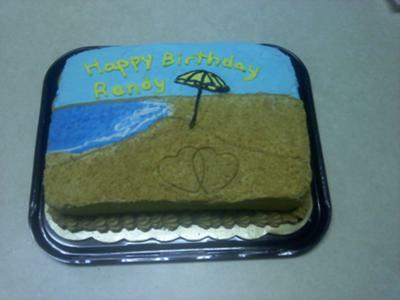 I then prepared a buttercream transfer using a coloring page of a beach. I traced the image in parchment paper and then flipped it over and using my premixed icing piped out the pattern and then filled it in. When it was finished I placed in in the freezer for 90 mins. I then frosted half the cake in a "sky blue" and hald the cake in a "sand" color. When the buttercream transfer was complete I gently placed it on the cake and pressed it down. I then pulled of the parchment paper and smoothed the image out. I used a Shell tip and piped shells in the same color as the sky and sand around the edges of the cake and mixed a graham cracker crumble to sprinkle on the cake as "sand". Then using a cookie cutter I "drew" interlocking hearts in the sand.